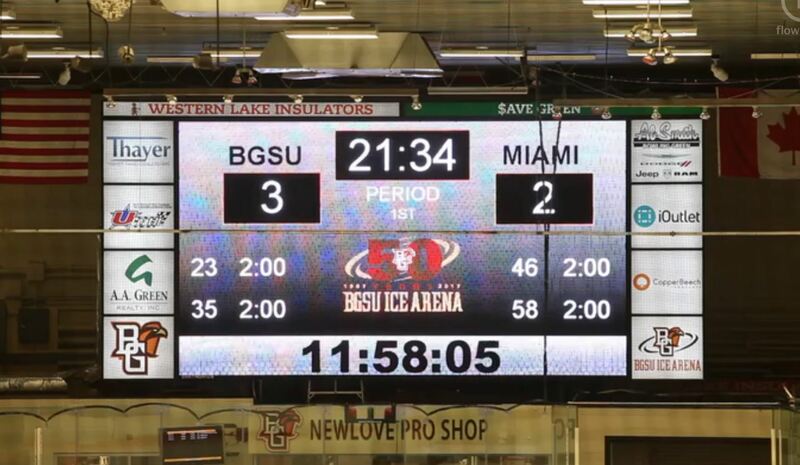 Ice Arena Video Board at Bowling Green State University | JDRM Engineering, Inc.
A $400,000 investment in the BGSU Ice Arena, the 14-foot x 24-foot Video Board weighs in at 2,400 pounds, adding great interest to the games with replays, live video feeds, playbacks and even a ship’s horn in celebration of home goals. 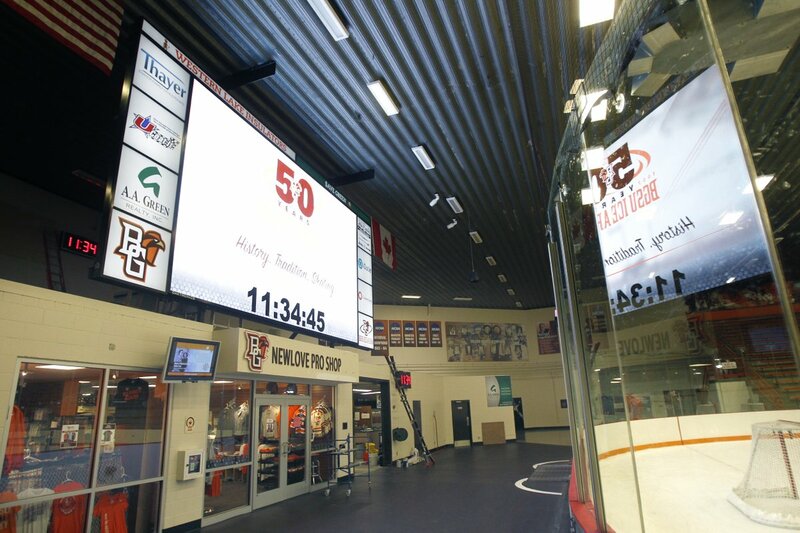 JDRM Engineering’s Technology Group provided the design of all electrical, technical, audio and fiber optics involved in adding this high-tech level of excitement to an already intense atmosphere at Falcon home hockey games. JDRM created two separate bid packages for the video board and its installation. The first package involved working in conjunction with video board suppliers and the university to create a competitive specification for an RFP for the purchase of the video board. In addition, a second separate package was issued for the infrastructure required to support the video board and the associated systems. Technicon Design Group worked under JDRM to supply the structural design for the board while JDRM provided electrical services, fiber optic cabling between the board and main video control rack, and broadcast cabling infrastructure for three camera positions for WBGU TV to broadcast the events live. 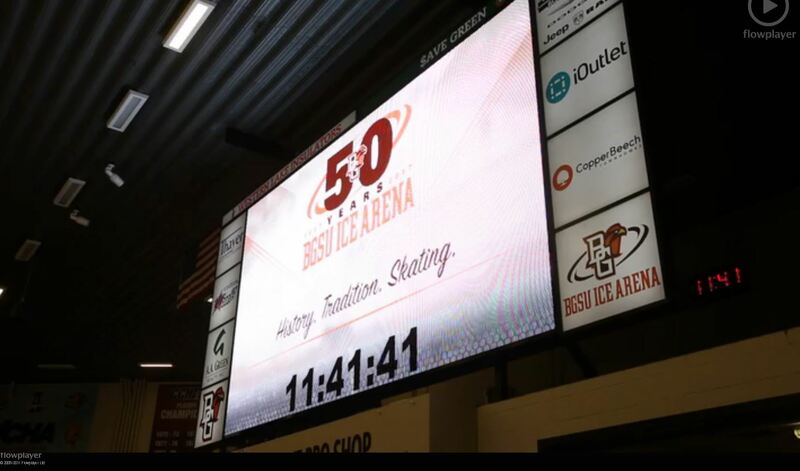 In addition to the video board, the project also required the installation of additional game clocks, relocation of the existing scoreboard to the practice ice, relocation of shots on goal boards, relocation of goal lights, and two new horn systems, one for end of periods and the other, a dual ships air horn, to celebrate goals by the BGSU Falcon Hockey Team. 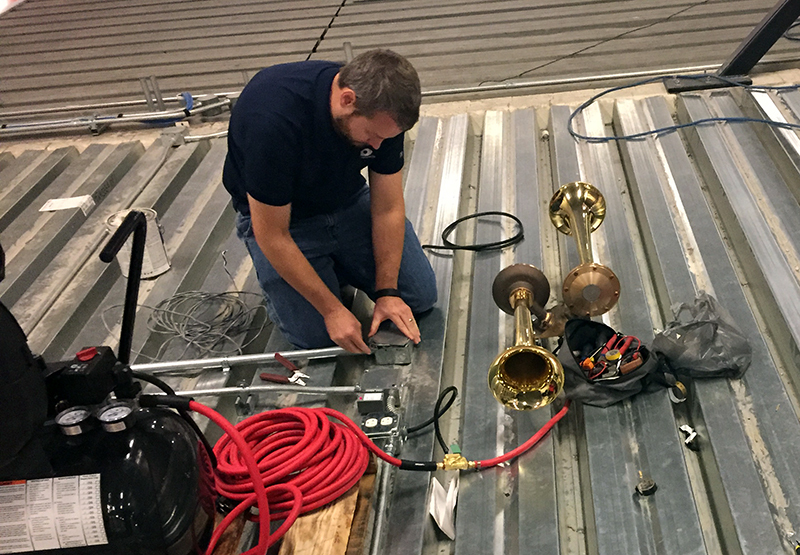 The ships air horn is powered by an air compressor and activated by a push button located at the scorer’s table to provide a fittingly-loud celebratory blast. JDRM also provided full construction administration services assisting in bid review, weekly construction meetings, contractor oversight, and coordination of contractors and video board suppliers to meet an extremely compressed schedule for delivery and installation in time for the first home game. Just how important is the ice arena?